Firstly, give up the yearning for fame. Fame is for the ego. The more you feed your ego, the more impoverished you are spiritually. Prahlada didn’t long for fame. Hiranyakashipu did. We know what happened to them. Secondly, stop chasing a Guru. We’ve been told repeatedly that when the student is ready, the Guru will come looking for him. It doesn’t work the other way round. Hanuman did not go looking for Ram. The flower does not chase the bee. Lastly, Guru is one. Hanuman dedicated himself only to one Ram. When you go after many, you go after none. Learn to see your one Guru in all plural forms. If you are asked “Is He there in this pillar?” Just say “Yes”. Pranams Gurudeva, for such direct instruction. We are your Hanumans, fortunate to serve your mission. We pray you always be our Ram. Please be in our hearts always, and guide us to our fulfilment. Jaya Guru Datta, Your Puttuji. Aprameya svarupaya Sivaya Gurave namah !! Jaya Guru Datta, Swamiji, when I first met You, so many of the other devotees had been guru hopping and they talked about being at this ashram and that one…of meeting this Guru or another one. I felt very left out because the only Guru I had ever met was Swamiji. But gradually I saw the emptiness in many of these people, their lost nature…..searching, searching, searching for some elusive power. Many of those same people are gone now from the Datta family….none are famous that I know of….I am reminded of the Guru Ashtakam….what good are fame and power without your Guru? Splendid message, any action by us is not just for fancy. Some try to exhibit their behaviour to be very pious and devoted, but it is always the mind that matters to be maintained pure and devoted. God is always happy with our intensions. If a person wants to help others and make minimal efforts to do it still He’s happy. But on contrast without good intensions if only pretends to be good or devoted that attitude is not going to help. An honest attempt to correct our mistakes and learn the right one makes us to walk towrds spirituality. I liked this message for conveying a strong message that spirituality is meant for following and not for showing off for any worldly benefits because spirituality is always beyond worldly benefits. Appaji we are very blessed to be with our sadguru who guides us and make us walk in spiritual path. and help to become a true devotee. On first August 2005 i had the wonderful luck for a personal interview with Sri Swamiji. This date is now my personal birthday. The presence of Sri Swamiji gave me an intense feeling of love towards Him which has grown more and more since this time. Now looking back to my life before and after this date “birthday” is indeed justified for this day. My life changed completely. It is now so much nicer, better, brighter, clearer. 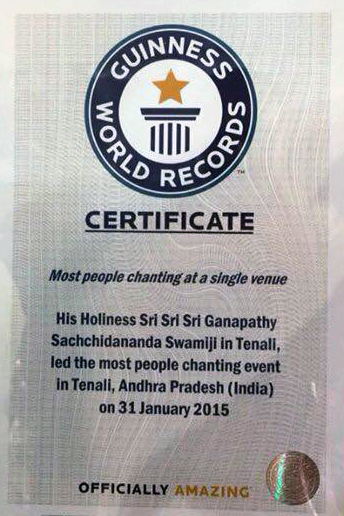 It is a wonderful change which happened by Sri Swamiji’s grace. I am thankful beyond all words. My only Guru is my most revered and beloved Sadguru, nothing else is really important Prostrations to Your holy Lotusfeet. Om Sri Mata. JGD Sri Gurubyo Namaha. We love You Sri Swamiji. Please continue to be part of our lives forever. Om Namo Hanumate Namaha! Sadguru you came to me when I was ready for you. I need no other. You have done and are doing everything for me. The things I wanted when I first met you , you did not give to me. Still I could not leave you although I was disappointed. Now , there is no other guru for me. If I were offered all the riches in the worlds I would never leave you. Nothing compares to what you give me! Please make me a good disciple. Please keep me always at your lotus feet. Jaya Guru Datta. Om namo Hanumate namaha. JAYA GURU DATTA! Beloved most revered Sadgurudeva, I hope so much that I can become really devoted, thankful and humble to earn to be with You for ever and ever and ever, my beloved Appaji Deva di Deva. Many many many pranams to Your holy Lotusfeet. OM JAGANMATRE NAMAHA! My Humble pranamams to SADGURU lotus feet. appaji just for fame is not going to be a spiritual path. this is so correct that we should pure heartedly always serve swamijis mission. always being pure heart in mind and service makes us grow spiritually. Millions of prostrations to the lotus feet of Sadguru Matha, on Devi Navaratri !! Appaji is Sri Rama. I surrender to my God. Appaji please allow me to be your Hanuman. We love you dearly Appaji. You are mother Goddess. I am so fortunate to have found you. I am very thankful that you decided to take me in your folds in this janma. Please keep such divine dhristi on me in my other janmas as well Appaji!! Sri Rama Jaya Rama Jaya Jaya Rama!! Om Namo Hanumate Namaha !! Sri Guru Datta Hanuman ki Jai !! Thank you Appaji for teaching us the important concept about Guru Shisya relationship. In today’s world there are many gurus, but only with one you can establish Heart to Heart connection, that is your guru. Lucky are we to be sishya’s of Sri Swamiji who has lifted us from downfall and guiding us always. Very apt and timely reminder. Who wants fame in this world, Appaji. Of what use? In fact, it is a distraction. You are Nectar! Your love has no parallel! One who tastes it can long for nothing else. Even the mighty Hanuman who had accomplished great tasks, sits in one corner and keeps chanting Rama naama…and cares for no outward fame. We are lucky for we are in Your fold, Appaji. Life is life, but with Your presence, it is beautiful! Sri Guru Datta. Jai Guru Datta, there is no doubt that you are Prabhu Ram. But I have to work on following the path of Ram’s Hanuman. JGD Appaji. All of us who are under your umbrella are truly fortunate. But our good fortune will remain and become better if we can all contemplate on your teachings and practise them. I have friends who think I am a fool to be spiritually inclined at an age when am supposed to be enjoying. But they do not know the permanent nature of my enjoyment with my friend, my sadguru. Help me realize more of your teachings and help me elevate myself on spiritual plane. JGD, SGD!! That’ s for sure, if we make the choice to elevate ourselfs in each situation, especially in those where we are accused, hurt, ect. maybe is this the beginning of being spirituel. Om namo hanumte namaha. Uns Menschen kommt unser Ego immer wieder in die Quere, wir möchten doch so grossartig scheinen. Liebster APPAJI, danke für DEINE gütige Klarheit. Namaste Puttuji, marvelous video. Thank You. Chasing after Guru’s just to earn fame does not make one spiritual. Right quote for the present era where having a famous Guru is prestigious. Spirituality is entirely different where one has to offer one’s fame at Guru’s lotus feet. This remembers me about Maharaja Janaka, Appaji described in Guru Gita that Maharaja Janaka’s Guru asks him to carry him on his shoulders in the streets of his kingdom. He had done without a word. That is spiritual, following Guru’s orders not bothering about one’s fame. Namaste Puttuji. Jai Guru Datta! I never was tempted to chase Gurus because i did not want a Guru. But i always wanted to go to India. And when this wish got fullfilled, the first thing that happened to me was meeting the most charming, radiant, loving, compassionate being that i even could not have imagined. No need to say who this being is……. The Guru-disciple relationship is the highest expression of friendship, for it is based on unconditional divine love and wisdom. To regain one’s divinity one must have such a master or Guru. He who faithfully follows a true Guru becomes like Him. But sometimes the training process is long and tough. We look for short-cuts and easy routes to attain realization. If things don`t go our way we blame the Guru for not guiding us properly. We try to follow another Guru. We are unhappy there also. This process of changing Gurus goes on and on. This finally leads no where. We must realize that though spiritual path is the surest path to realization, it is a long journey which requires a lot of dedication and faith. But, come what may, when we follow one Guru with unconditional faith and love, He will surely lead us to realization. When we are moving blindly through the valley of life, stumbling in darkness, we need the help of someone who has eyes. We need a Guru. I offer my humble pranams to pujya Sadgurudeva for being there for me always and guiding me in my spiritual path. Let us all follow our master with unconditional love and faith. Jaya Guru Datta! A Guru is one who uplifts you spiritually. He initiates you in the path of righteousness and self-realization. Following a Guru for fancy, or fame is ridiculous. As Puttuji very rightly mentioned, fame feeds ego! And that takes us away from our goal.Fickle-minded people only hanker from one Guru to another, looking for one who will feed their ego by praising them in front of others for their contribution. But that does not serve any purpose towards our betterment. A true Guru chisels away the negativeness of His disciples and is always targeting the ego. We need to respect all Gurus but follow only one. As our master is the only one who can deliver us from this worldly bonding. Lets us all with a steady mind follow our Sadguru and grow spiritually. Hanuman is a perfect example for how a disciple should be. Our Rama, our Sadguru, will guide us forever. Jaya Guru Datta. I just came across sri shankaracharyas statement in viveka chudamani and was once again deeply struck. translated in ammas monthly magazine (november 2012) as follows: there are three things that are rare indeed and are due to god’s grace: a human birth, the longing for liberation, and the protecting care of a perfected sage. although in a way I am aware what it means to be in association with a guru like sri swamiji the statement touched a deeper level of consciously cherishing and valuing the Divine grace that my beloved sadguru came in my life. I will never forget His sacred feet descending a stair to reach down to all of us sitting on the floor in a highschool in london. I dearly love it when You are sometimes addressing us Your mumukshas (mumukshu – striving for liberation, someone on the way towards liberation). may we be and become worthy of Your boundless love and grace. jaya guru datta, Om namo hanumate namah..
After experiencing You..there is no turning back or searching or seeking for anything.. basking in Your love and warmth, we have found ourselves and with Your blessings will know ourselves too.